Finally, quality steam that is easy to buy and affordable! Sign up now to get instant savings! EliteSteam steam shower bundles have everything you need for quality steam. 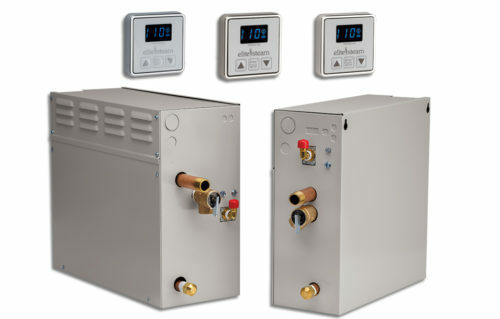 EliteSteam generators come in four preconfigured sizes, sufficient for showers both big and small. Adding a steam shower system to an existing bathroom is surprisingly simple because the generator’s compact design permits installation in almost any small space near the shower, such as a vanity or closet. Controls come in three stylish finishes: polished chrome, polished nickel, or brushed chrome. EliteSteam bundles have everything you need for quality steam. EliteSteam generators come in four preconfigured sizes, sufficient for showers both big and small. Adding a steam system to an existing bathroom is surprisingly simple because the generator’s compact design permits installation in almost any small space near the shower, such as a vanity or closet. Controls come in three stylish finishes: polished chrome, polished nickel, or brushed chrome. EliteSteam = Great unit, highest quality, easy install, cost-effective, wonderful company. I have installed and serviced thousands of steam units in the last 43 years I have been in business. EliteSteam has been added to our permanent line (and that's not an easy thing to do ). To my delight, I came across EliteSteam, announcing packages with excellent prices and value. I really did not want to spend lots of money but still be able to enjoy the steam. Today is my second day of using the EliteSteam steam shower. I love it. If you are considering a steam shower, please buy EliteSteam. If you’re working on a Budget and want to enjoy a basic, good quality steam generator that is easy to install and you will be able to get parts for, Made in the USA, Elite Steam is the way to go. I have been working in the industry and using this companies equipment for almost two decades and their customer service and equipment are second to none. I had the Kohler steam unit in my old house and I consider this an upgrade performance wise from what I have seen. The best part is that I actually saved a little money in the meantime! Great response time on questions good quality and fast shipping a plus! We have been enjoying our new Elite Steam Shower ever since we had it installed. What a pleasure to hop into a hot steam room in the comfort of our own home. Thanks to the Elite Steam Team for this innovation. The steam system arrived on time and was very simple to install. In terms of operation, it quickly heated up and produced the steam required. Definitely happy with the product so far. It was the perfect finish to my new house! There is nothing better that luxuriating in my EliteSteam shower on a chilly night. It clears my sinuses and warms my soul.